It’s a particularly busy week in the Supreme Court. In Courtroom 1 from Monday 25 February 2013 the linked appeals of BNY Corporate Trustee Services Ltd & Ors v Neuberger Berman Europe Ltd (on behalf of Sealink Funding Ltd & Ors), BNY Corporate Trustee Services Ltd & Ors v Patron EMF S.A.R.L., and BNY Corporate Trustee Services Ltd & Ors v Eurosail-UK 2007- 3BL PLC are listed for two days. These cases stem from the insolvency of Lehman Brothers, and concern the proper interpretation of the Insolvency Act 1986, s 123(2) as incorporated into a securitisation agreement – in particular whether a company is to be deemed “unable to pay its debts” by reason of the fact that its liabilities exceed its assets on its balance sheet, or whether some further test is involved. In Courtroom 2 from Monday 25 February 2013 is In the Matter of B (a Child), listed for 1.5 days in front of L Neuberger, L Hale, L Kerr, L Clarke and L Wilson. There are no case details currently available for this appeal. On Tuesday 26 February 2013 in Courtroom 2 are the cross-appeals of Benedetti v Sawiris & Ors, and Sawiris & Ors v Benedetti, which will run until Thursday 28 February 2013. In this matter the appellant had facilitated the respondents’ acquisition of a company, but the structure of the acquisition was very different from that envisaged by the agreement, with the result that the facilitator’s fee was not covered by it. It was found that 60% of the fee was covered by a brokerage agreement, and the appellant seeks the remaining 40%. The Supreme Court will determine to what extent the subjective valuation of services (both before and after the provision of those services) can be taken into account by the court when assessing the valuation of those services on the quantum meruit basis. Case details are available here. On Wednesday 27 February 2013 is the matter of Barts and the London NHS Trust v Verma. The appellant doctor brought a claim for unlawful deduction from her wages after the respondent employer found that the standard NHS Terms and Conditions of employment that provide for pay protection did not apply to her when she took a training post. This matter will clarify the extent of pay protection under the standard NHS Terms and Conditions of Service. Here are the case details. Finally, on Thursday 28 February 2013 in Courtroom 1 is the appeal of Jones (by Caldwell) v First Tier Tribunal & Criminal Injuries Compensation Authority. In this unfortunate matter the respondent sought compensation from the claimant authority after suffering catastrophic injuries when a lorry collided with the vehicle he was travelling in. The lorry had braked suddenly in an attempt to avoid a man who had run onto the road to commit suicide, and the respondent claims that the suicidal person’s actions constitute a “crime of violence” for the purposes of the Criminal Injuries Compensation Scheme. The Supreme Court will determine the proper test for identifying a “crime of violence” for the purposes of the Criminal Injuries Compensation Scheme 2001, para 8. Case details are here. 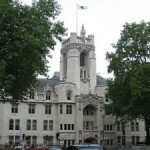 The Supreme Court will hand down three judgments this week: FSA v Sinaloa Gold plc & Ors, Davies & Anor t/a All Stars Nursery v Scottish Commission for the Regulation of Care (Scotland) and Joint Administrators of Heritable Bank plc v The Winding-Up Board of Landsbanki Islands HF (Scotland). Public Relations Consultants Association Ltd v The Newspaper Licensing Agency Ltd & Ors, heard 11 – 12 February 2013. Leave a reply on "In the Supreme Court w/c 25 February 2013"